Atlantic Station continues to be a popular destination for tourists and residents alike, and as the area begins to grow, there continues to be a wave of new developments popping up in the area. One new development is the Atlantic Yards office complex, under construction with developer Hines. This new complex is in its first phase of construction and is scheduled to be finished by the end of 2020. The Atlantic Yard’s construction, is a $189-million project along 17th Street, overlooking the connector. 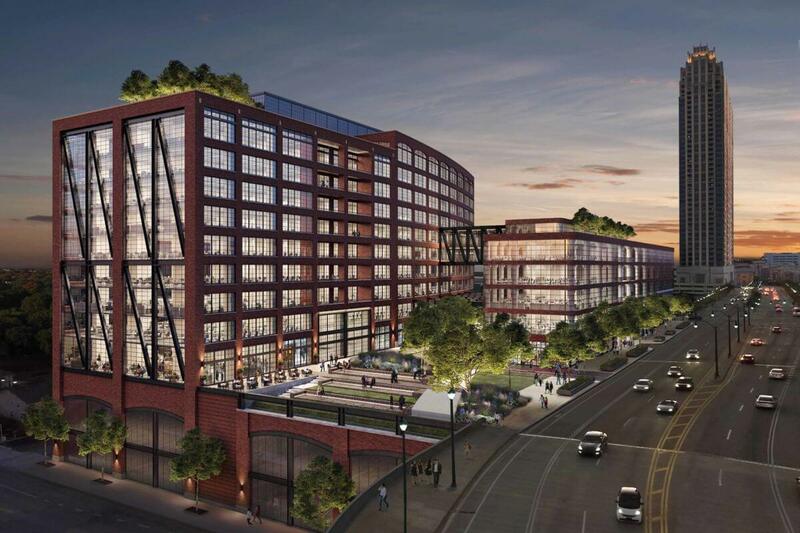 This brick-clad building will feature two office stacks over a three-story parking deck. With around 20,000 square feet at street level, this development will offer space for restaurant or retail and also feature green roofs. In addition to the Atlantic Yard’s project, Hines is also tackling the first large-scale, timber framed construction in Atlanta, dubbed T3 West Midtown. This seven-story structure will be the second of its kind in the United States. Vertical construction is set to finish in February, with the entire project on track to finish in September. This new development will bring 230,000 square feet of office space to the Midtown district. Framing an entire building in timber instead of concrete will offer unique loft office spaces showcasing 11-foot ceilings and allowing for a spacious 8,000 square-foot rooftop terrace. Hines is also spearheading the redevelopment of Atlantic Station’s Central Park. This redevelopment involves the demolition of a couple of buildings that once held retail and eateries in order to create a more pronounced central green space. Bisecting the retail options on 18th and 19th street, the Central Park lawn revamp will create a pedestrian-only experience in this area. The project is scheduled to be finished by Thanksgiving 2019 and will almost double the size of the green space, as well as introduce new retail and eatery options. There is also a plan to add a new video screen for outdoor movies as well as a prominent rideshare drop off and pick up area. As green spaces in urban areas become more popular, revamping Atlantic Station’s Central Park helps give Atlanta a competitive edge in urbanism. In an interview with Curbed Atlanta, City of Atlanta Planning Commissioner Tim Keane praised the green space expansion. The Central Park revamp is only one of several development projects underway at Atlantic Station. Plans for new hotels, and an apartment building are scheduled too. These changes will impact the look, function, and feel of this neighborhood. If you would like to learn more about what the construction means for the Atlantic Station and neighboring areas, we would love to talk about the impact of this rebirth, especially for our residents at Atlantic. The rise of each of these projects is said to have a dramatic and positive impact on home values and resale opportunities, which is quickly being realized for local dwellers. For more information, call us at 404.845.7724 or visit our website https://evatlanta.com.